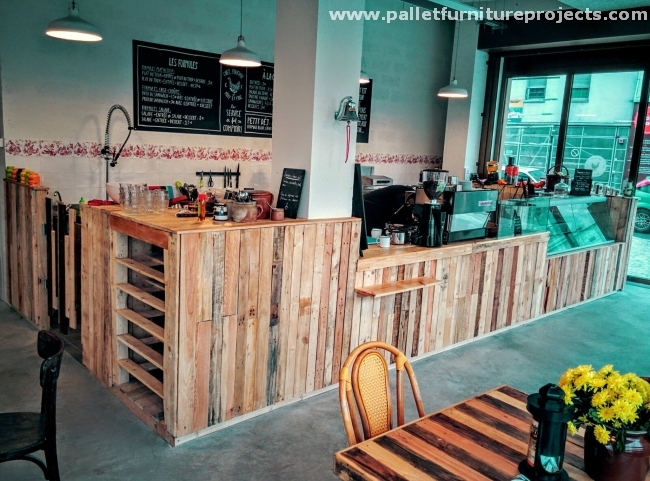 We just have gone so far in the pursuance of wooden pallet recycling. This is a high time for us, we are having a massive support from our folks and subscribers, and that is a huge moral support for us that keeps us going in full swing. We have become so damn addicted that we are switching the market base furniture items with our self made wooden pallet furniture items. 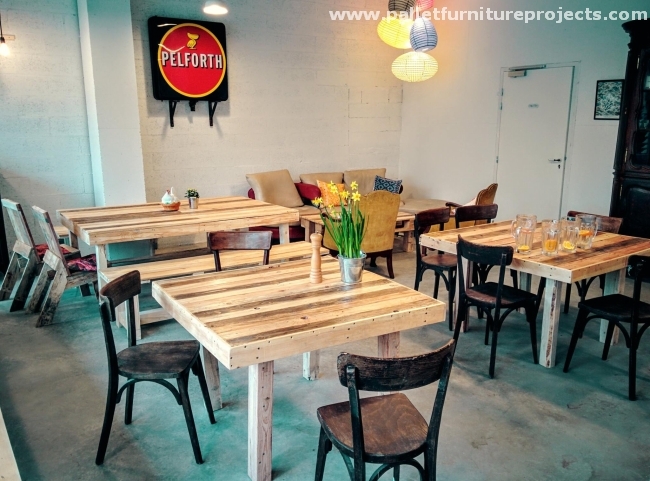 Here in this article we would be introducing a number of wooden pallet furniture items for a restaurant, just to show you he true potential of the wooden pallet creations. 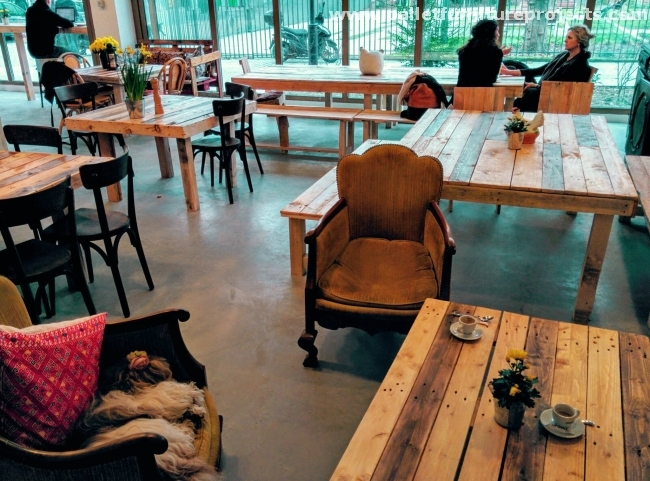 Just get started from here, we see a delicate centre table right in the middle of some casual wooden chairs. This is so damn straight and simple wooden table that is just damn handy to make. A true crafter would make it within a couple of hours if he is well versed. Now in this picture we are given a wider look of the venue, this seems to be a restaurant where casual sittings are welcomed. 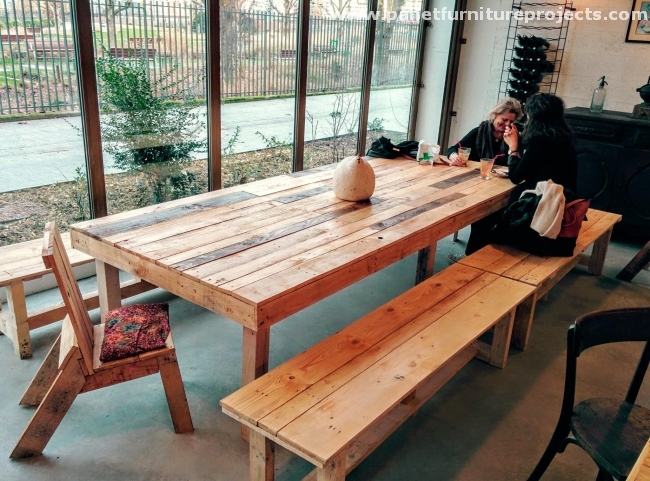 So is the sitting plan in the restaurant, seems like each and every wooden furniture installation is recycled with the wooden pallet. Wow, just hold your breath before having a look on the next furniture item for the restaurant. 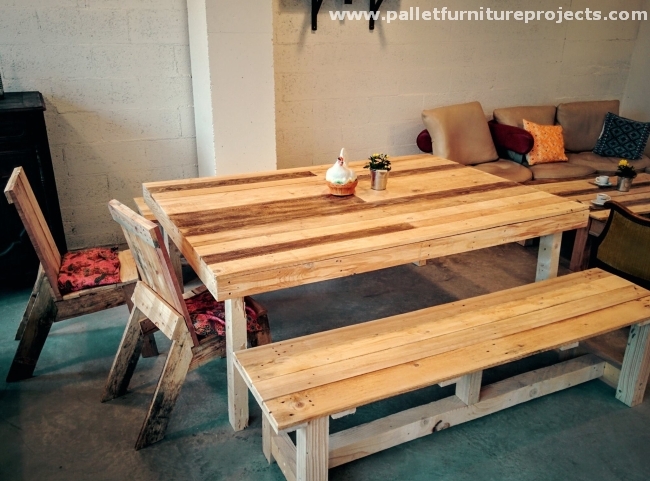 Well, this is a long wooden pallet dining table along with a number of Adirondack chairs and benches. The casual look of the venue is maintained to the max. 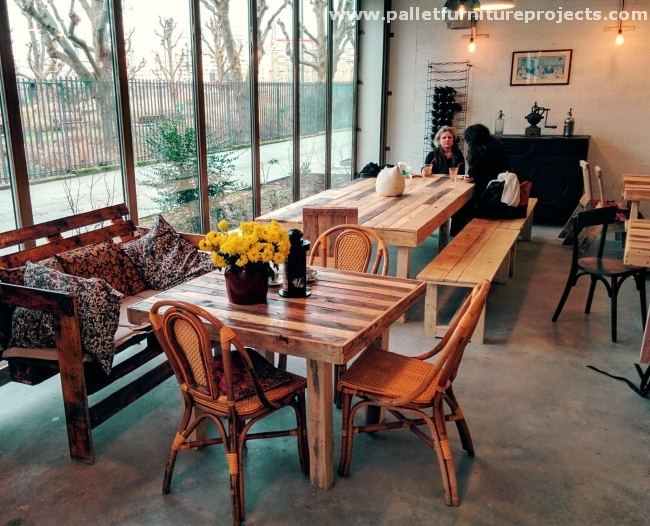 Now come to the other side of the lobby, have a detailed look of the entire venue and you would hardly find any wooden fixture that is not made using the raw wooden pallets. 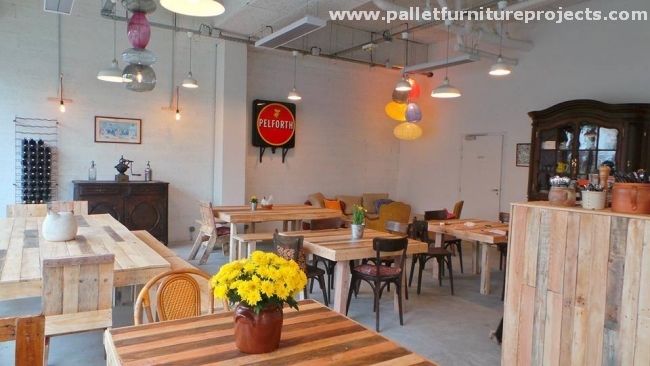 Let’s pick odd out, maybe the sofa, and the slim chairs in the corner are exceptions, rest is the pallet world all around. My goodness, the plan is probably made by some pallet fanatic who is so damn obsessed with the wooden pallets and their recycling. And for sure he has saved a large amount by pallet recycling. 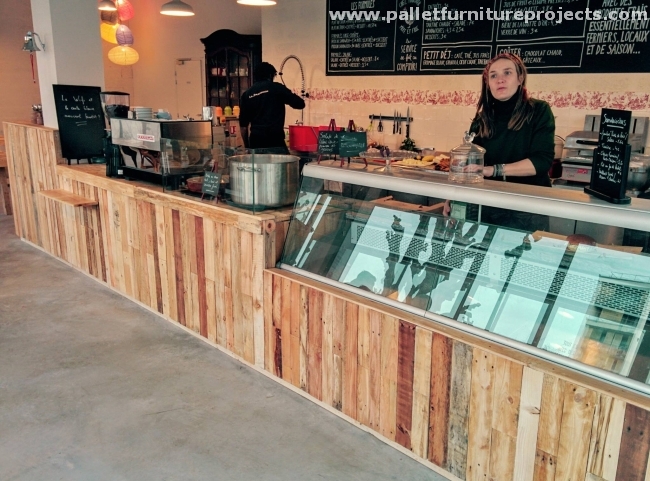 Look at this elegant counter and display huge table, same pallet planks are the main material except a few inches of glass. After having a detailed discussion on the centre table and long dining table, have a look on this traditional pallet wooden couch having comforters and cushions. This would give you the best view of the outside area. This is another angle of the centre table that we have discussed earlier. Just have a look on the rustic appearance of the wooden pallet furniture items, the crafter haven’t even bothered to stain them. They just look pretty awesome the way they are, need no addition or any modification in their general appearance. And this is the broader view of the reception and display desk. I haven’t witnessed such an awesome set up of a traditional restaurant all recycled with wooden pallet. 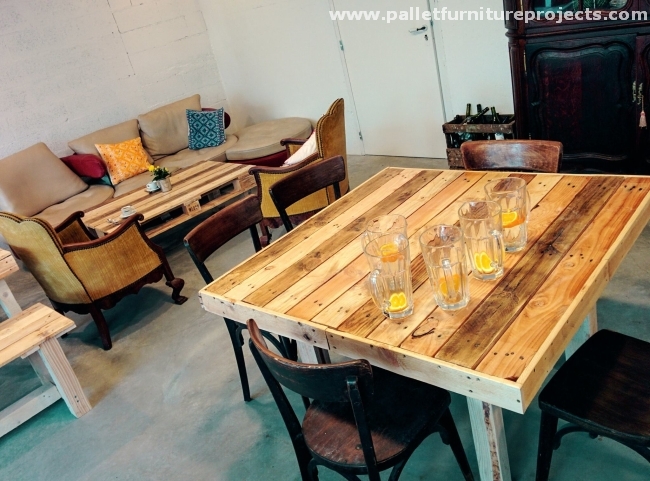 Each and every furniture item and installation is the brain child of pallet crafter, and so smartly executed. The entire set up is simply marvelous.